But the people’s love of internet freedom endures. 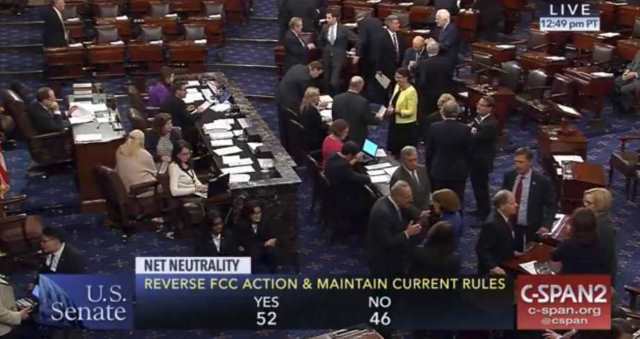 In a recent poll, 86% of persons stood against the FCC net neutrality kill order. That number includes 82% of Republicans and 90% of Democrats. That broad public support should brighten the outlook for internet freedom, as the fight continues on several fronts. The Republican-majority Congress and President Trump have used the Congressional Review Act (CRA) to cancel many recent Obama administration health and safety rules. Now there is congressional action to use the CRA to cancel the FCC’s net neutrality kill order. And last month the Senate passed a bill for that, 52-47, with three Republican senators joining all Democratic ones. But in the House, 22 Republican representatives would have to join all 193 Democratic ones to get the majority needed to force a vote and pass the bill. So far, 172 of the 215 needed are on board. The deadline for passing the bill is the end of the current Congress, which is around the end of this year. Should it pass, the bill would face a final hurdle — getting Trump to sign it. Since the FCC issued its order to kill net neutrality, several states have taken action to keep it. In Montana, Vermont, New Jersey, New York, Rhode Island and Hawaii governors have ordered that ISPs doing business with state government must keep to net neutrality. In New York, Rhode Island, Massachusetts, Nebraska, New Jersey, Vermont and South Carolina legislators are preparing laws to guarantee net neutrality. And such laws have passed and are on the books in Washington and Oregon. Also, on May 30, the California Senate passed a strong net neutrality bill — restoring the 2015 “bright-line” standards (no blocking, throttling or paid prioritization), closing the loophole of zero-rating to favor an ISP’s own content, and banning state and local contracts with ISPs not keeping to the standards. Now, the bill awaits action in the California Assembly. However, the FCC put a clause into its net neutrality kill order to ban states from overriding the order. So, big telecom would likely cite that clause, and challenge the states’ net neutrality standards in court. 21 states and D.C., as well as tech firms and advocacy groups, have filed lawsuits to stop the repeal of net neutrality. The 21 states are all those in the nation with a Democratic attorney general. A federal court has consolidated the lawsuits into one. About the coming court case, Techdirt blogger Karl Bode tells us, “By law, the FCC has to prove that the broadband market changed substantially enough in just a few years to warrant such a severe reversal of popular policy.” So, the suit should have a good chance to succeed. However, it may take a year or so for the case to resolve. An act of Congress could — for better or worse — override all state and legal action. Congress could pass strong legislation that puts the 2015 net neutrality standards, oversight and enforceability into law. Or, maybe even better, Congress could ban big corporate ISPs from providing their own content. With a law like that a big ISP could focus on providing a solid, fast connection, instead of pushing their own, and tamping down competing content. But Congress could also pass weak, “Trojan Horse” legislation, such as that proposed by Republicans Rep. Marsha Blackburn (R-TN) and Sen. John Kennedy (R-LA). Their bill (HR 4682/SR 2510) would ban outright blocking or throttling of websites. But, the bill would allow the known tricks of paid prioritization, zero-rating. and the devising of interconnection bottlenecks. The bill would ban the FCC, which is a rule-making body, from making any rules regarding those tricks or any others that big ISPs might come up with from now on. The bill would also override any stronger state and local laws, and change ISP classification from telecom service to information service, which need not treat all communications equally. As your constituent, I urge you to join in signing the discharge petition for the Congressional Review Act resolution to cancel the FCC’s net neutrality repeal. UPDATE: On June 20, a California Assembly committee gutted what was the strong net neutrality bill mentioned above. “It is no longer a net neutrality bill,” a visibly frustrated Wiener said after the vote. In an unusual move, the committee voted on the bill before Wiener was given a chance to testify. “I will state for the record … I think it was fundamentally unfair,” he said.